Why would you want to live in this village? Why would you want to visit this village? These two criteria combined are intended to ask the question: what are the ‘Wow’ factors of the village. The Competition looks at all aspects of village life: community and social activities and cohesion, sustainability, the provision for the younger and more senior residents, the use of IT and social media, local business involvement as well as tidiness and the welcome visitors receive. It is also an opportunity for people of all ages and from all walks of life to work together to bring about improvements in their village. Newcomers Cup - this is awarded to a village that has not entered before but is ajudged to be the best newcomer village that year. Winners in each category will receive a cash prize of £250 to spend on something for their community and then go forward with the chance to become the overall Northamptonshire Best Village winner. The Best Village winner will receive a cash prize of £1,000 to be spent on community benefits for their village. 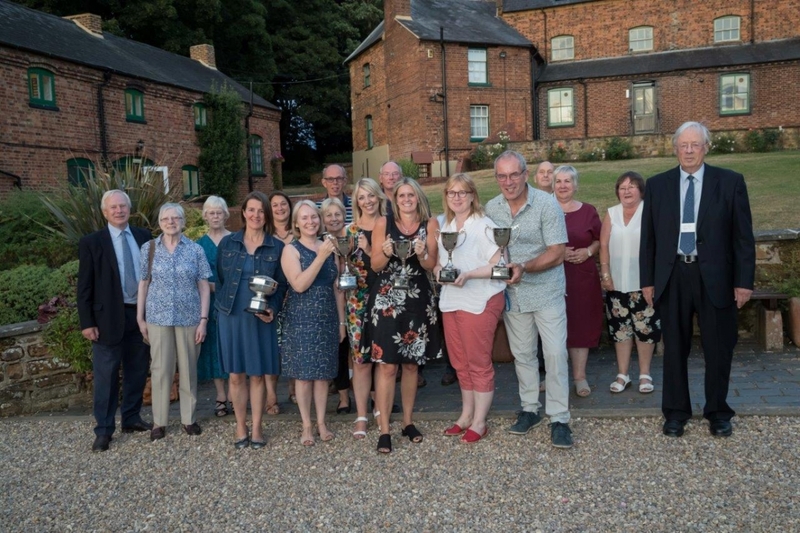 The winners of the 2018 Northamptonshire Best Village Competition were announced at a fantastic Presentation Evening held on Tuesday 17th July 2018 here at The Hunsbury Hill Centre, Harksome Hill, Northampton. David Laing, H.M. Lord-Lieutenant of Northamptonshire and President of Northamptonshire ACRE, presented delegates from the winning villages with cups and certificates. David Scudamore, Chair of the 2018 Northamptonshire Best Village Competition and trustee of Northamptonshire ACR, announced the winners during the evening celebrations. 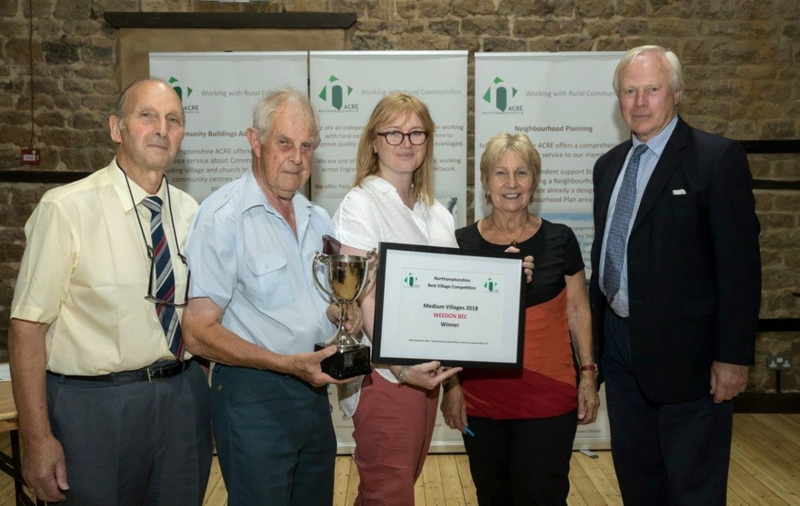 The village of Moulton was the overall winner gaining the prestigious title of the 2018 Northamptonshire Best Village and winning the prize of £1000 to be used for community projects. Representatives of Moulton, seen here with David Laing (right) are holding their certificate and Best Village Cup. Representatives of Weedon Bec, which was the runner up, are seen here with their awards,. 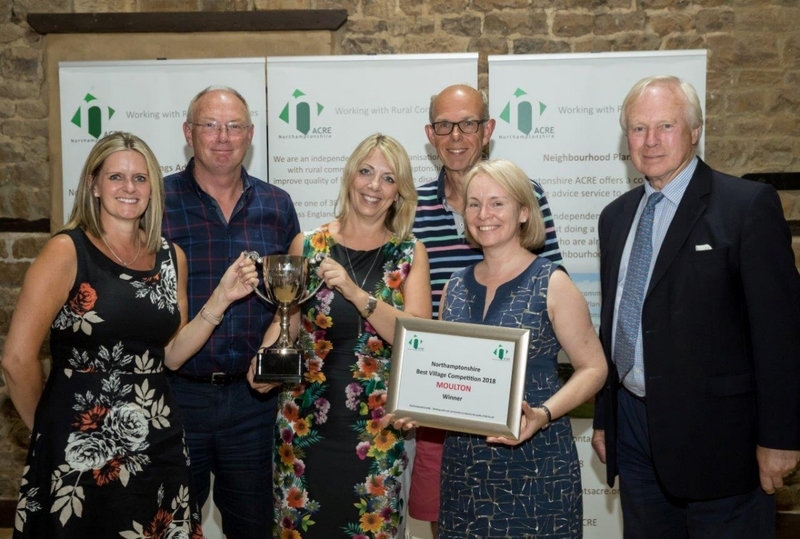 The Competition is run entirely by local volunteer organisers and judges and is administered from Northamptonshire ACRE’s offices in Hunsbury Hill, Northampton. If you are interested in becoming a judge for the Competition, this poster gives more details or please contact Rebecca Breakwell on 01604 825884 or email [email protected]. Full training is given to all judges and expenses paid.